Spacious flat with lovely views set in conservation area. Set in the beautiful Aiguablava bay, the refurbished flat forms part of a low rise building. The south facing Lounge with sea view, leads on to southwest facing balcony with dining and seating for 6 having peaceful views over orchard. Well equipped Kitchen/Diner again seating 6. 1 ensuite double bedroom, 2 further twin bedded rooms which lead directly onto the balcony. Further full bathroom. All bedrooms have good cupboard space and there is a DVD, music centre and 'ipod' docker. Cots and high chairs available by request. Set in peaceful gardens with pool and children's pool. Table tennis, volly ball and toddlers play area on site and tennis and golf close by. Beach 15 minutes walk. 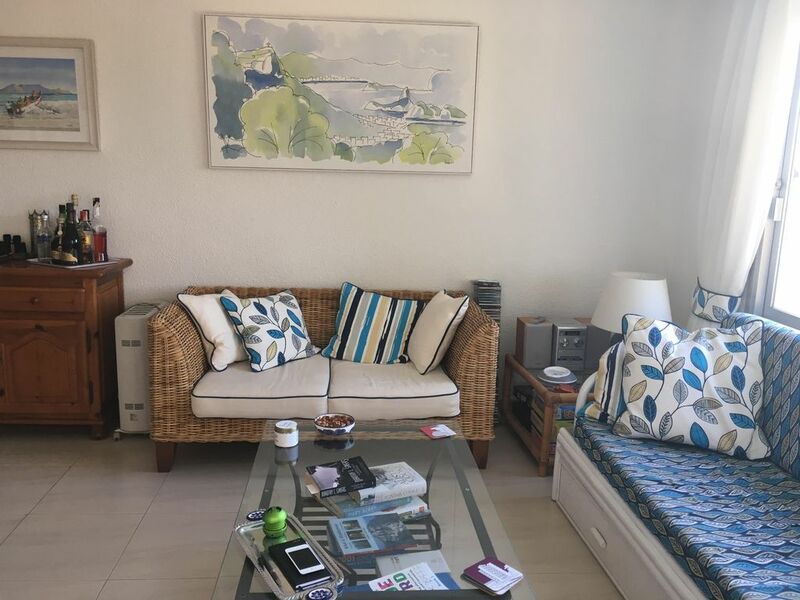 Location: The flat is located just 5 minutes drive from the sandy Aiguablava beach which has 4 beach cafes; and 15 minutes walk from Playa Fonda shingle beach. Sports: The championship golf course of Pals is about 12 minutes drive and there are other excellent courses within 30 minutes drive. There are numerous tennis courts in the area. We first visited Aiguablava when our son was 2, now we have wonderful holidays with his children - Aiguablava is that sort of place. We truly unwind here. We never considered a holiday home, but when this became available, it seemed the perfect thing to do. We have never regretted our decission. Lovely views, a sunny aspect and, whilst it does get busier in the height of the season, it is a lot less busy than most places and for most of the year it is a peaceful idyll. One reserved covered parking space. Private south-west facing balcony with awnings. There is a designated covered parking space. There are 2 steps into the building but it is then level to the lift and the apartment. There is a resident Spanish speaking caretaker on site. It is a great home! We already stayed several times there! This is a great property! Feels like home! Hi Monica, it was lovely to host you and the family again. Close to many beautiful coves and we used the coastal path to hike to some. We loved the pool - large enough to swim proper lengths and work off the numerous ice creams we consumed over the week! Nearby Begur has plenty of good restaurants. Apartment is well appointed and the balcony enjoys the late afternoon / evening sun. We are so glad you discovered our beautiful coves, some of the best can only be reached on foot. We find there are more and better restaurants every year, you can find something to suit everyones tastes. Thank you for leaving the flat so clean and tidy - our cleaners commented on the fact! Well equipped spacious apartment in beautiful relaxing surroundings! Aguablava and Begur are surely the best hidden secret in Europe. The conservation area ooses beauty, tranquility and many fabulous Restaurants specialising in fish and Spanish dishes. Add this to a totally equipped apartment with a warm and friendly host, what more could you ask for? We will certainly return. The accommodation was perfect for a young family with a superb pool and grounds. We stayed here with our 5 children aged 6-16 for 2 weeks. The appartment is spacious and perfect for a family holiday, it was well equipped for our mainly self catering holiday with all kitchen appliances, hairdryer, iron, hoover etc. The owner was very helpful both before and during our stay. The appartment is set in lovely well kept grounds with a large pool which we all enjoyed. A car is advisable to get to nearby shops/restaurants, Although there are popular beaches within walking distance. Overall we had a great holiday and hope to return at some point. Thank you so much for your lovely review. I am sure this will help would-be guests. Very nice apartment. Perfect for our needs. Well equipped, clean and comfortable. Quiet picturesque position.Large pool. Sue is very helpful and we would have no hesitation in recommending this lovely homely apartment. Aiguablava is one of the most beautiful bays on the Costa Brava and one of Spain's secrets. The picturesque towns of Begur and Palafrugel with their lively markets are close by. Cots and high chairs available upon request We regret cot liens are not included since we find guests prefer their own for infants. All rental rates include professional cleaning at beginning and end of your stay, bed linens and bathroom towels.